So last week I went back home to Liverpool and went shopping with my mum. I popped into MAC just for a browse and saw the most beautiful eye-catching orange lipstick jumping out at my from the stand. I couldn't just walk away without buying it so I got out my purse and wandered over to the till only to realise I had a MAC voucher that I hadn't use so it was a free lipstick - happy days! The lipstick in question is MAC Morange. It comes in MAC's standard matte black packaging and is an amplified lipstick. 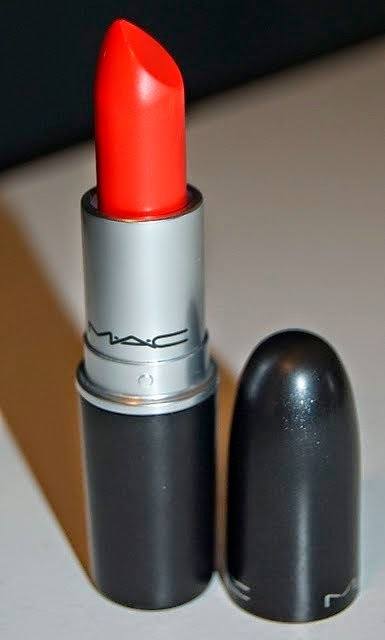 The lipstick itself is a bright bright orange shade and is so in trend right now. It looks amazing with a tan and I cannot wait to wear it when I go away in August with my family - I tried it out last week when I went to Majorca for a few days with my mum and it looked lovely. The formula of the lipstick is creamy and even if you suffer from dry lips it doesn't matter because it glides onto the lips. I don't own many orange lipsticks so I thought it was about time to add this colour to my collection and at only £15 it's not a bad price!! I would definitely recommend! What MAC lipsticks would you recommend! ?